The patented Watermark Training Belts are all about resistance training. When used in the water, the swimmer is "forced" to use the exact muscles, in the exact environment, in the exact way to move. This added resistance builds not only muscle but the swimmer will be led to be as efficient as possible because of the added resistance. This leads to better technique, ideal stroke placement, and efficiency. In addition, the Watermark Training Belt is an exceptional tool to build overall conditioning and world class endurance. There is a FREE training manual available on this site written by well known Canadian coach Sam Montgomery who has been using swim weights for more than 25 years. For dryland training, the Watermark Training Belts are perfect for power walking and treadmill workouts. An individual can add the resistance and elevated heart rate that would be accomplished by jogging or running without the pounding and injuries. 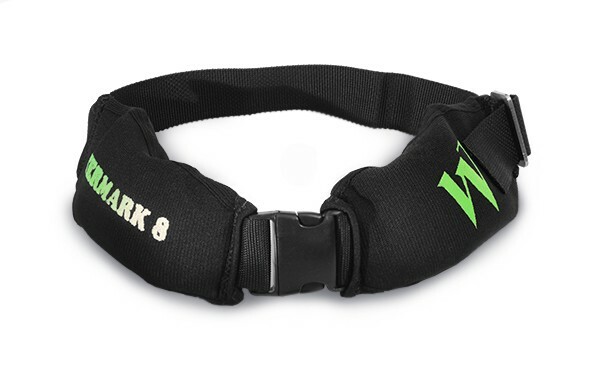 Watermark Training Belts are available in 3, 4, 5, 6, 8, 10, 12, 16, 20 and 25 lbs. so an athlete can continue to increase their resistance training and strength by using a heavier size. One size does fit all, with each Watermark Training Belt fitting waist sizes from 18" to 52". All made in the USA. When is a better time to get faster, stronger, better than now?